Marist men's tennis earned their first win of the season over Bucknell 5-2. 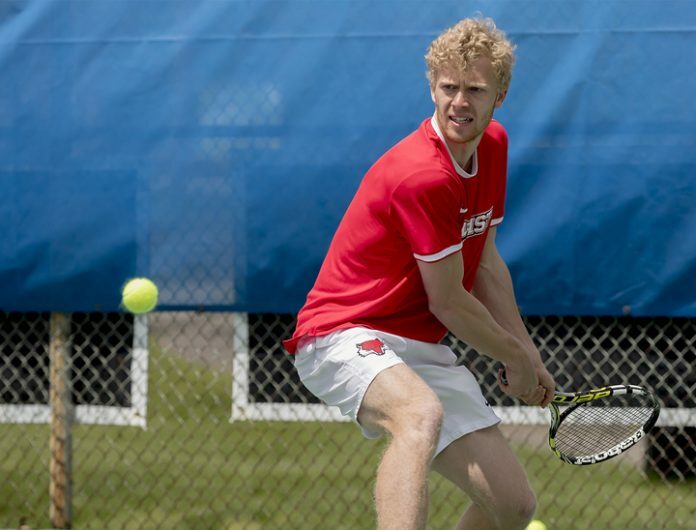 LOUDONVILLE– Marist men’s tennis earned their first win of the season over Bucknell 5-2. The Red Foxes squared off against the Bison as part of the Siena Invitational held at Tri-City Fitness. The win brings the men’s overall record to 1-1. The men won four singles matches on the day with a couple of them going down to the wire. Christopher Gladden won his first set to Andrei Vitiuc 6-2 but dropped the next one 5-7. He rebounded in the tie-breaker set 6-3. John Oxner dropped his first set to Alex Pedrazzini 2-6 but came from behind to win 7-5, 7-6. Piotr Sowinski and Carlos Moreno played in the first doubles spot and lost a tight match to Max McDonald and Andrei Vitiuc 7-6. The team of Gladden and Oxner took down Pedrazzini and Jurist 6-1 from the second doubles spot. Schouten and Darrington posted a 6-3 win over Jacobs and Krantz from the third doubles spot.